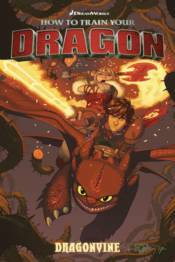 Hiccup, Toothless, and the rest of the dragon riders encounter two deadly, yet mysteriously linked, threats: One is an island consumed by Dragonvine-an uncontrollable force of nature that's poisonous to humans and deadly to dragons. The other is an all-new, all-terrifying dragon species-the web-spitting Silkspanners! o Writer, director, and producer Dean DeBlois is coplotting these stories. o Stories tie in to the upcoming 2018 film.